Give Enemies in your game Brains! Are you ready to make your game's Enemies a whole lot more interesting? Brain Boards are a brand new feature in Bloxels that gives creators the ability to give the Enemies in their games "Brains"! Use your Bloxels Gameboard to make your enemies faster, stronger, or bigger. Each color you place on the gameboard when adding a Brain affects a different attribute of your Enemy – mix and match to see what happens! Add an array of colors on the gameboard to dictate how you want your enemy to behave. Want him to be stronger? Add a bunch of red blocks. Want him to give up some coins when you blast him? Add some yellow blocks to the mix. Experiment to make a variety of different enemies. In the configure menu of the enemy you want to add a brain to click the camera button to capture your Gameboard. This will add it to the enemy. Tap the Brain Stats icon to see how your brain measures up! Follow this step by step process to add Brains to your Enemies. Don't be afraid to experiment! 1. Tap an enemy to configure it. 2. Tap the camera icon to add a brain. 5. Tap the brain icon to check the stats. 6. Ready to go? Click save! Use this color key when building your brains and remember, it doesn't matter how they are laid out on the gameboard. Find a brain you like? You can save it by dragging the brain to the panel on the right side of the screen. Change the size of your enemy by adding blue blocks to the Gameboard. Make it HUGE! Each blue block will make the enemy a little bit bigger... Up to 3x normal size at 26 blocks! Add more yellow blocks to the Gameboard so that the enemies give up some coins or hearts after they're defeated. One coin granted for each yellow block! 10+: Along with coins, a Health bonus of 1HP, plus one more for each additional block! Use red blocks in your brain to make your enemy pack more of a punch. Enemy deals an extra 1HP for every two red blocks! 0: Enemy deals the usual 1HP per hit. Load the Gameboard up with green blocks and the enemy will take your hero's coins. How greedy do you want these bad guys to be? 10+: Each time the enemy hits you, it will steal each heart that you lost and re-energize! Use pink blocks on your Brain Board to make your enemy take more damage to defeat! Enemy has an extra 1HP for every two pink blocks. 0: Enemy can be defeated in one hit! 4: Enemy has the usual 3HP. 20+: Your projectiles bounce off the enemy! Use bombs! Want your enemies to be fast? Load the Gameboard up with some orange blocks. Want them to be slow? Like, really slow? Leave those orange blocks off. Turret enemies can’t move, but adding orange blocks will speed up their projectiles! 0: Super slow patrol speed. 4: Enemies move as fast as they normally do. 5+: They keep moving faster and faster! 0: Projectiles move at normal speed. 20: Enemy projectiles move at half the speed of your hero's! Single shots? Spread shot? Lasers? HEAT SEEKING LASERS?!?! You decide what your enemies will shoot by adding different numbers of purple blocks to your Gameboard. 0: No projectile for Patrollers and Flyers. For Turrets, the usual firing rate. 6-10: Spreadshot! More blocks means more projectiles in the spread. 11, 12, 13, 14: Lasers! Fixed directions; right, up, left, and down. 15, 16, 17, 18: More lasers! Fixed directions; up-right, up-left, down-left, and down-right. 19+ Heat seeking lasers! More blocks and the laser will track the player faster. NOTE: White Blocks are not used for Brain Boards. Check out a few of these awesome Brain Boards in action. 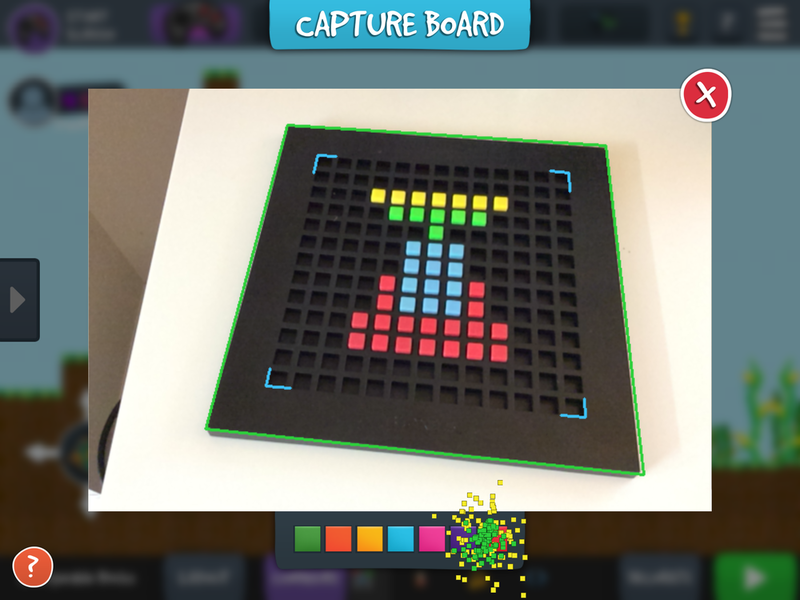 "Brain Boards" is a Bloxels Gameboard Only Feature.